The Derilinx Open Data Impact Series promotes awareness, adoption and use of Open Data in different sectors, and supports the publication of high-quality Open Data. The inaugural session ‘Creating Business Opportunities with Open Data’ focused on how Open Data is a valuable resource for businesses, which can be used to build new applications, enhance existing products or provide additional context for decision-making. The panel discussion took place on 26th Sep 2017 in the beautiful No. 25 Fitzwilliam Place, and was well attended by representatives from industry, government and academia. It was great to see how much interest there is in the application of Open Data across many different sectors. The panels comprised of technology and innovation experts, in fields such as transport, finance, health, retail, and insurance, to name but a few. The first panel addressed the myth ‘there is no data available in Ireland’ and also discussed the importance of Open Data in the wider data ecosystem and technology sector. What Open Data is available in Ireland? Evelyn O’Connor, Head of the Government Reform Unit in the Department of Public Expenditure and Reform, provided an overview of the National Open Data initiative, including the roadmap outlined in the Open Data Strategy 2017-2022 and that Ireland is internationally recognised as an Open Data Leader, ranking 3rd in a European Open Data Maturity Study on Open Data readiness, maturity, impact and policy. Evelyn described how the National Open Data Portal data.gov.ie has grown from 450 datasets at its launch in 2014 to over 5,400 datasets today, and was awarded with a 2017 eGovernment Award. Evelyn also outlined that the Open Data Unit is supported in its activities by two key governance structures: the Open Data Governance Board, which provides strategic leadership and governance in line with best international practice in the area of Open Data, and the Public Bodies Working Group (PBWG) which provides technical guidance that supports the Open Data Initiative. How can Open Data be used for business innovation? Ken Finnegan, Chief Technologist with IDA Ireland, highlighted the impressive infrastructure that exists here in Ireland to support growth and innovation, including Galway Smart Bay, Dublin Smart City, and the acclaimed Research Centres. Ken described Ireland as a testbed that is ‘small enough to trial, and large enough to prove’ innovative products and services, and that Open Data has an important role in supporting and driving new technologies, such as the Internet of Things and Artificial Intelligence. One of the goals for Technology Ireland is that Ireland is a digital leader. Paul Sweetman, Director of Technology Ireland, explained that this means improving digital literacy and improving the overall infrastructure. Open Data is critical to this, as it represents a source of innovation and can support services to citizens. Although we are still in the early days of Open Data in Ireland, it is important to recognise that we have come a long way already. 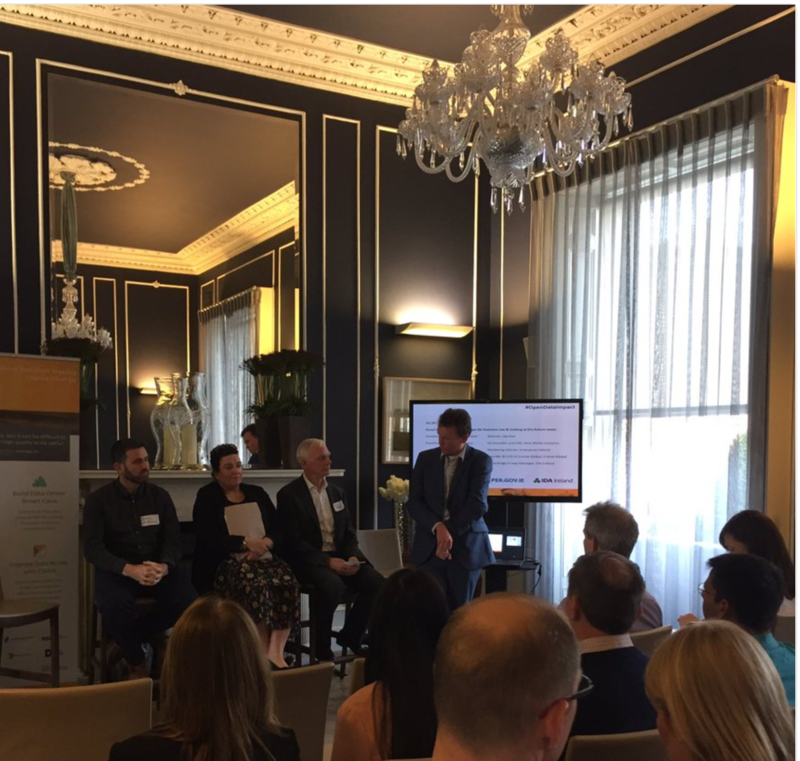 The second panel included representatives from organisations that are actively using Open Data and examined how this could be built upon in the future. To open the discussion, Dominik Dahlem, Director of Machine Learning at Optum, outlined the importance of being able to access the raw data, so that data scientists have the complete picture when building models. Additionally, knowing the provenance of the data is key to understand where the data comes from, its trustfulness and if it can be reproduced. Kate Minogue, Data Science Manager at Bank of Ireland, discussed how machine learning can be used to identify trends and patterns in products and customers. Kate highlighted that Open Data can provide valuable context for internal data collection and augment it, supporting decision-making and analysis. 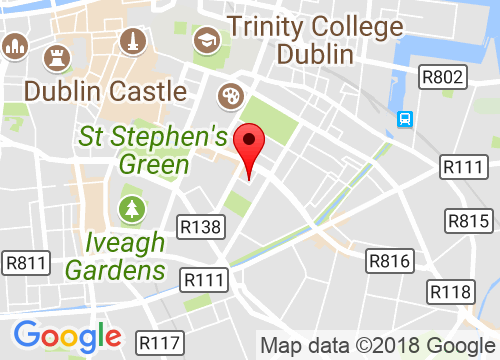 Startups are increasingly using open data as part of their business model, and one of our panellists, Brendan Cunningham, shared with us his experience in integrating Open Data in the notification service Pin Points Alerts. Critical to providing such a service is the availability of up-to-date, and ideally standardised, Open Data from across all Local Authorities. For Emer O’Byrne, Home Portfolio & Underwriting Manager & Broker Software House Manager at AVIVA, there is a demand across many sectors, including the insurance sector, for Open Data. Open Data, such as Ordnance Survey data and flooding data can be used in data models to help measure risk and customise what products are available. The availability of raw data as Open Data was reemphasised by Conall Lavery, CEO at Real World Analytics. Conall provided two cases of how they have used Open Data from the UK to build health applications, including an analysis of patients at risk of diabetes. 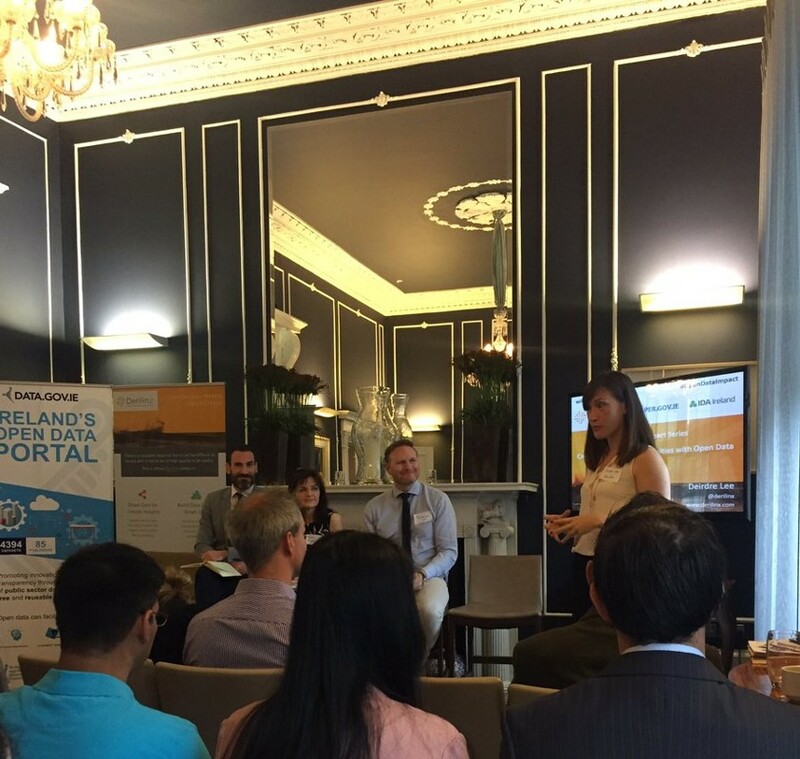 Maria Gavin, Manager of the Small Business Innovation Research (SBIR) programme at Enterprise Ireland, agreed that it is important to for businesses to go to public bodies and show them how you can add value with Open Data. SBIR projects can help businesses to build out business cases that utilise Open Data. Additionally, Cronan McNamara of Creme Global pointed out that there is a need for public-sector bodies to change their mindset about publishing Open Data. Often, the focus is on reasons why data can’t be published, instead of looking at how data can be made available as Open Data. Should data publishers focus on specific areas? While many participants agreed that all eligible data should be made available as Open Data asap, some thought that this may lead to a deluge of information, and it may be more beneficial to focus on demand-driven datasets. However, all agreed that making more use-cases of Open Data in practice available would help both data users and publishers. 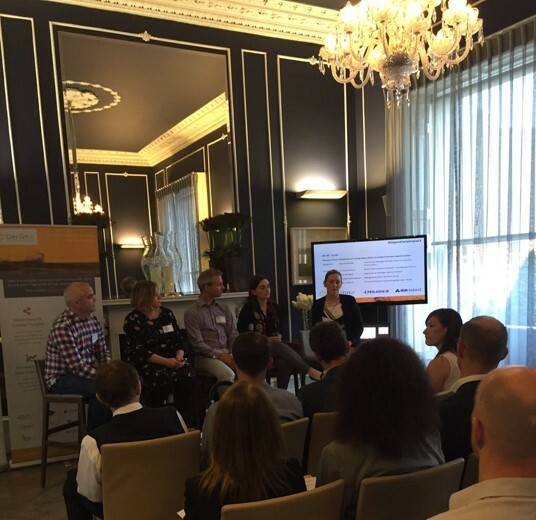 How can engagement with businesses around Open Data be improved? The creation of communities of data users, online or through events, would increase feedback from the private sector around Open Data usage. Different organisations could connect in a common ground and share their experience about value obtained by using Open Data e.g. improvement in service offering, increase in revenues, and cost savings, and also how challenges were addressed. Open Data can present many opportunities for businesses, although companies also need to have the right structures in place that allow for experimentation with new data sources. Which are the most common challenges experienced when using open data? The most common challenges that organisations face when reaching out for Open Data are often related to data discoverability, accessibility and data quality. If you would like us to keep you informed about our future events and activities, subscribe to our Newsletter below!